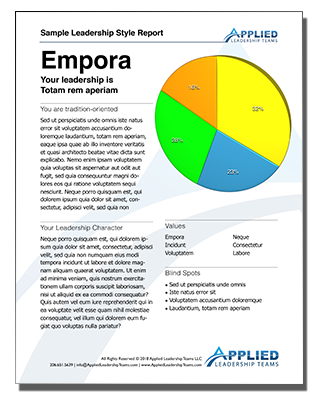 Applied Leadership Teams offers an easy to use Leadership and Communications Assessment to help you understand yourself and others better. This tool is easily learned, lastingly retained and powerful if used effectively. Contact Us for group pricing, leadership and communication workshops, webinars, or brown bag lunch and learns. After you purchase the Leadership and Communication Style Assessment you will be directed to a webpage to take the assessment. The email and phone number you enter will verify your purchase. Once you submit the assessment you will be contacted by email with your results within two business days.